We are an internationally operating organization in the field of sustainable systems specialized in Phase Change Material implementations. We provide solutions for complex energy and climate issues and have created a strong position in this mainly project driven market. Based on our knowledge and experience from these challenging projects, we developed a range of smart PCM-based concepts and products. Two products we now introducing are: CALDAMAR™, a Vacuum Tube Solar Collector with an integrated thermal battery based on PCM technology and CALDAMEG™, a heating system based on a CO2 heat pump with a PCM-boiler which replaces the traditional (central) gas heaters in buildings. CALDAMEG™ is specially designed for our domestic market where the government stimulates renewable heating and taking measures to reduce heating by natural gas, especially for the housing environment. By implementing our concepts into the built environment it becomes possible to independently generate the amount of required energy. Our knowledge in Phase Change Materials, its potential and our experience in climate technology is recognized and well appreciated by our customers and partners. We provide sustainable solutions which involve climate technology, energy saving and thermal storage in the best interest of our customers and our planet. Our GAIA PCMs are implemented to ensure that the pavilion requires little to no energy for the building’s climate control system. The PCMs (Phase Change Materials) melt at 20 degrees so that they can absorb significant excess heat in the building. Warmth is then released during cooling. This technology removes the peaks from temperature fluctuations. 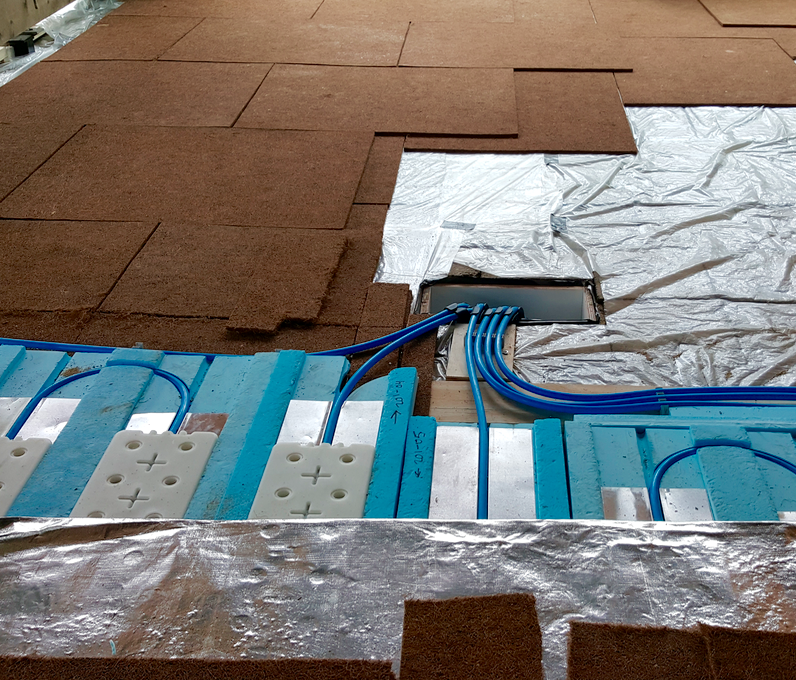 Water-bearing pipes under the mats allow the mats to regenerate if necessary during overheating. These materials are also installed in the ceiling where ventilators are used for air flow. Regeneration occurs principally at night using outside air. Heating and cooling occurs with a reversible heat pump. Lances have been drilled into the ground to utilise the constant temperature deep under the earth’s surface. One of the heat storage methods runs via the sprinkler buffer. This buffer is a large container of water to enable sprinkling when necessary. As this buffer is a required component, it can just as well be used to generate energy. When the warm water is required, it can be extracted; the same applies to the cooling. Trek Benelux has situated its new headquarters in the Bouw & Infra Park in Harderwijk. 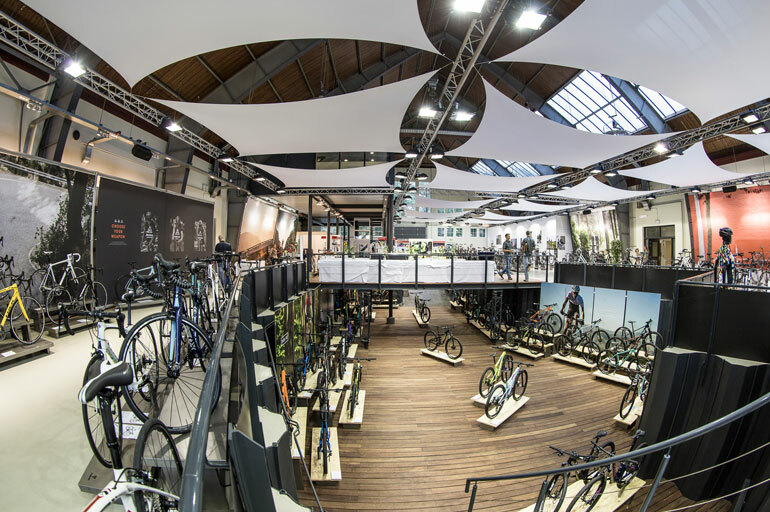 Bicycle factory Trek Benelux stands for innovation and sustainability. These standards also apply to the systems within their head office. Heating systems for the new office are connected to the existing Bouw & Infra Park heating grid. This heating grid is heated via a biomass system; the system is fed using woodchips from local pruning waste. Floor heating was selected for the Trek Benelux offices. Air conditioning is provided by an absorption cooler connected to a cold buffer tank filled with PCM balls at 14°C. An absorption cooler utilises a unique innovation which draws warmth from the heating grid to generate cooling. To ensure continued sustainable cooling throughout the summer, a solar boiler has also been installed to supply the required heat. The acquired cooling is stored in a buffer tank filled with PCM balls. By applying the PCM balls, the capacity of the buffer tank is increase by a factor of 4 which has a highly beneficial effect on the measurements of the buffer tank. The cooled water is used to generate cold air flow throughout the Trek Benelux offices via ventilation boxes. Boonstoppel Engineering designed the system. Global-E-Systems and Energy Outsourcing Solutions were responsible for providing the absorption cooler, solar boiler and buffer tank with PCM. We also installed the components and integrated them into the existing system. For the realisation of its new office space in Barendrecht, the board of GKB mobilised the highest level of sustainability, the BREEAM-NL Outstanding. The achieved EPC is more than 100% better than the government standard. For this project, Global-E-Systems provided an innovative climate control solution. This PCM solution is utilised in the building for the storage of warm and cold temperatures. The PCM mats are regenerated during the night with cool evening air so that they can provide office cooling the following day. The building has therefore no need for an active air-conditioning unit. When the temperature rises above the melting temperature of the PCM mats, these will begin to melt and absorb excess heat. When the temperature drops, the stored heat will be re-distributed. In these phase transitions, large amounts of energy are stored and released. ABN Amro has opened an energy-neutral bank office at the Bagijnenstraat in Alkmaar, The Netherlands. The building can independenty generate 100 percent of its required energy. This CO2-neutral building of ABN AMRO is equipped with an ecological climate system of global-E-systems. Approximately 30,000 kilos of encapsulated Phase Change Materials are cooled at night, after which they cool the indoor climate during the day. ABN AMRO received the Breaam Excellent-certificate for this energy-neutral bank office. De Kleine Campus is a contemporary working community in the former gymnasium of Arnhem – a monumental building with a large green space, close to the dynamics of the Spijkerkwartier and the city center. A place that offers plenty of space to work, develop, meet and relax. At the Small Campus you can rent your own studio or office, use the shared meeting and event rooms or a day of work. De kleine Campus has taken a big step towards sustainable energy by installing an environmentally friendly wood pellet stove. The central heating will no longer burn on fuel oil but on CO2-neutral wood pellets. 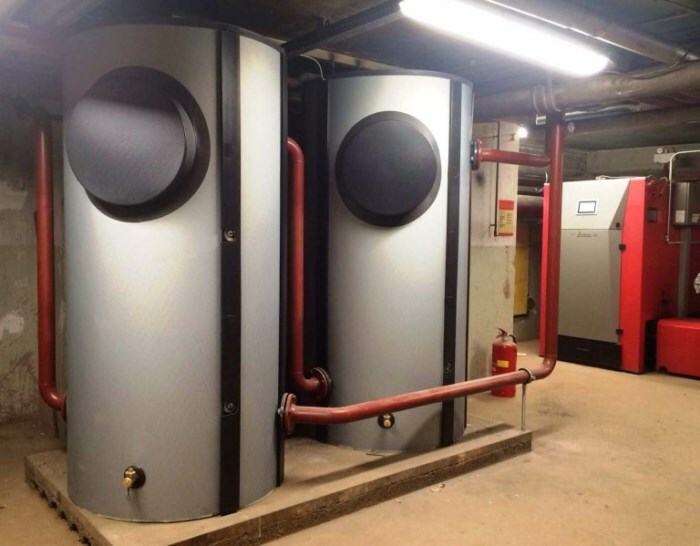 The installation consists of 2 wood pellet burners each of 150 kW and 2 buffer vessels of 10,000 liters. The buffer vessels from Global-E-Systems contain innovative GAIA PCM balls (phase Change materials) that hold the heat and energy to use it at another moment. A number of companies at the Arena Park office in Hilversum, The Netherlands have chosen to work together to achieve a more heat-efficient supply. The biggest challenge was to store heat during the winter months. In order to be sure of a sufficient heat supply, it is usually necessary to have a very high buffer capacity. In This is why they chose to install buffer vessels filled with GAIA PCM balls. With the implementation of Phase Change Materials the buffer vessels it was possible to use smaller buffer vessels and make the installation suitable within the design contours of the boiler housing. Our partner Boonstoppel Engineering has designed the installation. The return is well above expectations! We also improved the indoor climate in the office of Heembouw in Roelofarendsveen by implementing Phase Change Materials. The office space is located on the 2nd floor in a part of the office space, which is constructed as a lightweight construction. As a result, the walls contain little mass. In recent years, the heat load in this space has increased enormously. That is why it was time for change. The number of temperature shift hours had become unacceptable, with temperatures exceeding 25 degrees Celsius almost 400 hours per year. With the use of Phase Change Materials this is reduced to an acceptable level. PCM’s are materials whose phase change, from solid to liquid and so on, is used to store and dissipate heat. In PCM’s, heat is stored for later use. The point of PCM’s is that in case of a lot of sunshine, the room does not get a high temperature very quickly, because the PCM absorbs the heat, and that in case of colder weather the PCM releases the heat again. The result is a “more even temperature” in the building. The application of PCM therefore makes the temperature more even, without large air conditioning installation. A sustainable solution with low energy consumption because less cooling capacity is needed. The result is a drastic reduction in the number of exceedance hours. A recent study by the Ministry of Housing, Spatial Planning and Housing (VROM) shows that 86% of the classroom in schools during the heating season is insufficiently ventilated. The temperatures in the rooms are therefore too high. In approximately 56% of the classrooms examined, the capacity of the ventilation facilities does not correspond to the statutory performance level. High School, Rijkswijks Lyceum has decisively dealt with this problem. Four years ago, the school community invested 1.2 million euros in heat and cold storage and the necessary constructional facilities. Each room is individually air-conditioned by means of geothermal heat and cooling fan convection. After this operation, the gas bill decreased by 75%. However, there were still three rooms left, of which cooling was almost impossible: the theatre that is also used as an auditorium, the media library with many computers and the porter’s lodge. The walls in the theatre are made of glass so that it can reach 30 degrees in summer. The library contains 40 computers that blow out heat all day long. Meanwhile, the theatre, the media library and the porterhouse are equipped with PCM panels and PCM climate change flap islands that store heat in the winter, which will be used the next day to spoil the rooms. In winter, the principle works the other way around. In the night, the PCM mats in the ceilings cool down and that coolness is used again to condition the rooms to a pleasant temperature. The stage in the theatre space is used for the storage of fifteen thousand PCM18 balls. These are used for the air conditioning of the auditorium. The climate systems of the school community in Rijswijk and the implementation of PCM’s are causing furore in Rijswijk. Companies regularly come to see how the climate problem has been tackled here.